While in college and early in my career, it was beat into my head that startups were not a viable choice as an employer. My peers and I were taught that startups were unstable and hard work. We were told that they couldn’t offer the desirable things that big corporations could, such as career growth, benefits and a retirement fund. But as years went by and people within my social circles matured, I’m now suddenly surrounded by individuals who have/are creating startups, work for one or have a desire to work for one. And by learning from them and comparing corporate experience against startups, I’m starting to wonder if we were all taught wrong. Yes, startups are hard work. As some have told me, there are a lot of challenges when it comes to working at a startup. There are times where one day things are going great and then the next day you could be out of a job. Long days and late nights are common. Also, let’s not forget the anxiety of the daily uncertainty that comes with working at a startup. However, despite all of it, these individuals still prefer that environment over a corporate one… and for good reason. You learn to be resourceful and independent: Unlike in established organizations, things in a startup aren’t neatly mapped out for you with standard operating procedures and extensive training. Additionally, you may not have experienced professionals to turn to if you have a problem or need help. Even though this might seem like a negative, it can actually be considered a positive because you’d have to learn how to be resourceful through research and self-education. Being independently resourceful, working closely with others and experiencing trial and error can boost your critical-thinking skills more than learning through traditional training. Critical-thinking and problem-solving skills are among the most desired skills by employers, even more so than actual job experience sometimes. You’re exposed to new job functions: Because a startup is typically in a development, maintained or growth state, organizational structure might not be set in stone yet. Also, many job functions may not have been established yet due to lack of capital resources to put towards those full-time salaries. It’s not uncommon for people in a startup to wear multiple hats in order to keep the company afloat and progressive. Because of the blending of roles and the fact that multiple departments will work together, you could be exposed to new skills and knowledge. Diverse skills can help you become better-rounded and understand business on a deeper level. Also notable, it might boost your engagement because you aren’t strapped down to a monotonous job function. Consistently being challenged is very important when developing yourself professionally. You learn a sense of accountability and loyalty: Since startups are generally small or mid-sized, there tends to be a level of transparency in the organization. Not just about the company details but also how your contributions make an immediate impact. Some of the laxed atmospheres of startups also allow people to voice opinions and suggestions and work to make them happen. Having a voice and seeing how your work directly impacts the business can create a sense of accountability and loyalty. Suddenly, you know exactly how you’re making a difference and that can be something to be proud of. You can see how you’re valued. In larger organizations, it might be a bit harder to get that feedback and see how you are helping the company. Also, some might feel like they can be easily replaced because the lack of transparency. You have more control of measuring your results: Going off of accountability and seeing your personal impact, this can also help you measure your results better. Because you’re deeply involved in processes from start to finish, you can have better insight into measurable results. This can not only help you improve processes but also gives you a better look as to how you are progressing in your role. Having control over this and truly understand how it’s being measured may offer better feedback than a traditional performance review. You can keep your integrity: For me, this one is a big one. We’ve all seen it in the news; major scandals in large corporations; employees being mistreated; leaders stealing from pensions; unethical business dealings… just to name a few. Competition can get the better of companies and suddenly they’re overpromising to secure business and end up under-delivering. Boosting bottom lines can mean compromising the moral fiber of the company and then these leaders expect their workers to support those skewed values. It’s a pretty terrible feeling to compromise your own integrity just because the company culture has shifted into something lacking basic values. With startups (at least good startups that haven’t been tainted), people still believe in the greater good. They’re working towards something that matters. Yes, making money and staying afloat matter but egos, pressure and cockiness seems to be less present. Of course, the aforementioned isn’t true for every startup or every traditional organization. The key is to be sure to do your research. There are plenty of types of startups out there, from small to mid-sized, shipping to funded and more. It’s important to know what your basic needs are to support your livelihood and understand what qualities you respect in an employer. Knowing these things can help you find the right startup culture for you and hopefully that can help you build the skills you need for a stronger professional path. Looking for a job at a startup? Check out StartupHire. As an active or passive job seeker, the job market can be a bit tricky. Even more so, job seeking can seem intimidating when a seeker is constantly reminded of all the things they need to do in order to stand out to a recruiter. One of the popular tools job seekers and recruiters now utilize is LinkedIn. Although this has been used for several years now, seekers who are new to the platform or haven’t used it often enough may not know the ins and outs of this social media platform, including the expected etiquette. As a recruiter, I’ve seen the painful misuse of this site which may or may not have cost candidates a job opportunity. LinkedIn is not Match.com: this is by far the worst offense myself and other recruiters have experienced. LinkedIn is a site for professionals to network and shouldn’t be utilized as a primary source to find an intimate relationship or hook up. More importantly, these intentions (either sweet or inappropriately worded) should not be the first form of communication to a new connection. If you are a job seeker at a job fair, would you approach a recruiter at their booth/table and say the same things? No. LinkedIn is not Facebook: LinkedIn is a fantastic way to share news, industry-related content or even promote your own content to build a personal brand. Plenty of professionals have used this well and I’ve found it to be a great source of information. However, there are a few people out there who use the “update status” section as a way to post useless information. Honestly, there are plenty of people who misuse the same feature on Facebook, but at least that site is a bit more casual in comparison to LinkedIn. If you’re a job seeker trying to get your name out there, do you think irrelevant or inappropriate posts are going to help you show prospective employers your worth? LinkedIn is not Instagram: Of course, some professions are much more creative than others and LinkedIn can definitely be used to promote these portfolios. However, if you are in this type of profession or even if you’re not, there should be a limit to what you post. Much like the inappropriate dating emails or irrelevant status updates, images shared on LinkedIn should be reflective of how you’d want to present yourself to a recruiter or hiring manager. Nix the awkward selfies as your profile pictures. Try to avoid “oversharing” by posting pictures unrelated to what should be shared to your network. LinkedIn is not Twitter: Twitter is a great way microblog, self-promote, network and just post a quick update. It’s not uncommon for people to post several times a day and with Twitter chats being a great way to virtually network, it’s not uncommon for people to post several times an hour. However, this elevated amount of posting should be kept exclusively to Twitter. LinkedIn’s newsfeed is already bombarded with an obscene amount of content. 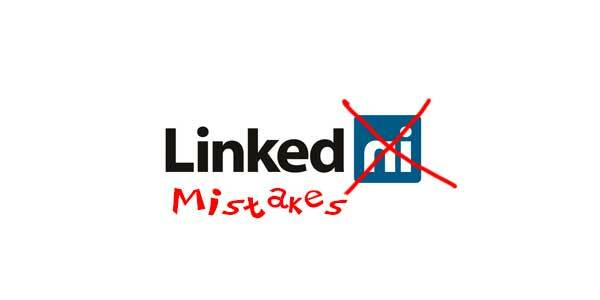 Limit your LinkedIn postings to a reasonable amount on a daily basis or weekly basis. You don’t want to annoy people with your over-posting to the point where they end up hiding your updates. This could seriously work against you if you ever do post any updates you want seen. Of course, no one is perfect and there’s no perfect way to be a LinkedIn member. Even I’ve been an offender of some of these situations. Some people might like what you share, while others won’t. Some posts might work for certain professions while others don’t. The important thing is to do your homework, understand how this platform works and really research your “audience”. And always err on the side of caution. If you think your postings can work against you in your job hunt, then reconsider before you post.